America’s roads have suddenly become dangerous places for America’s children. At least, that’s what’s suggested by a flurry of viral stories involving kids and cars. In May, an inebriated Florida couple made news when they took their granddaughter for a joy ride, pulling her behind their SUV in a toy car. Then came the story of an Indiana dad, arrested after strapping his four children to the car hood to get them home from a quick liquor store stop. Next, it was the stoned Arizona mother who secured her weeks-old baby in its car seat, popped the seat on top of her vehicle, and drove off. 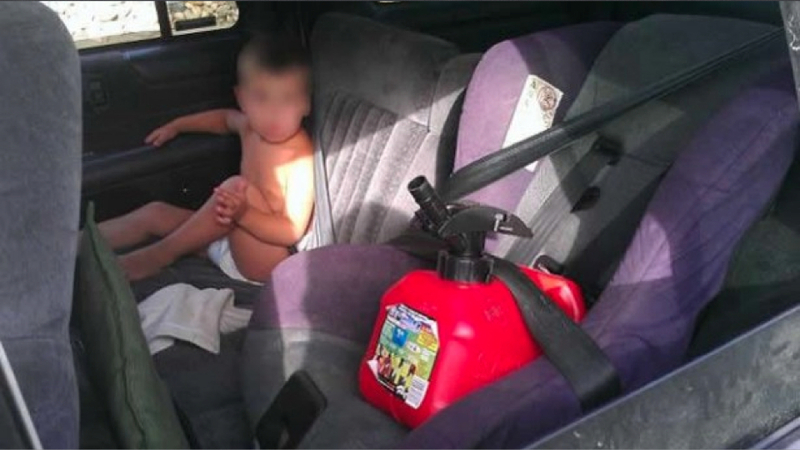 The latest item grew out of a snapshot, taken by a Colorado police officer, of a diapered toddler restrained only by a seat belt while his child safety seat, buckled in next to him, cradled a can of gas. While the nation may be experiencing a statistical rise in stupidity, substance abuse, or child neglect, more likely we’re just enjoying better access, through cable news and social media, to tales of bad parenting, tales we can take perverse pleasure in consuming and sharing. It’s simple and satisfying to stand in judgment of these “horrible parents” whose choices were so obviously wrong. Here are selfish people who put loved ones into terrible danger, something we would never do. Their evil, then, becomes our good. Why, though, would we need these object lessons to highlight our own good parenting? Perhaps such high-contrast, black and white stories help quell the anxiety of transporting our children through the problematic gray area that is modern American car culture. Cars — equipped with safety seats or not, piloted by sober drivers or not — present real danger to kids. Despite improved auto and traffic safety, they remain the number one killer of young people aged 5-34. Yet many new parents relocate to car-dependent suburbs, and many towns resist expanded transit lines or walking and biking paths, theoretically to protect their families from crime. Feeling children are safer in remote communities, these parents end up driving them everywhere, often to school, despite the fact that they would be about 20 times safer taking the bus. Seeking to protect them from the horrors of climate (but not climate change), moms and dads drive their young ones to school in inclement weather or idle at bus stops to shuttle them, warm and dry, a short block home. Especially in more affluent suburbs, “good” parents can achieve that status by continually running up the odometer on their children’s behalf. Driving Jessica from taekwondo to soccer practice one day and from play date to math tutoring the next says Mom values her child’s developmental opportunities more than she values her own time. To wit, Subaru’s “Hockey Mom”, whose love for her athletic triplets is measured in miles — and, naturally, her choice of vehicle. As children reach driving age, the role of “good” parent evolves from Chauffeur and Careful Consumer to Conscientious Mentor and Really Careful Consumer. And while educating teens about traffic laws and investing in car safety options is smart, we still fool ourselves that we can keep our children safe on the roads. We fool ourselves that we can keep the youngest safe by always putting them in child-safety seats, though the majority of these seats are incorrectly installed. In a recent study, less than a quarter of vehicles tested made it easy to install them correctly. We fool ourselves that we can keep teens safe with serious talks, such as that given by the father in the powerful “Baby Driver” commercial (also by Subaru), which doesn’t just tug at heartstrings but plays them like a virtuoso harpist. Nevertheless, the majority of high school seniors admit to texting while driving. We fool ourselves that we can keep teens safe by buying the “right” car, a comforting and profitable fiction perpetuated by every ad like VW Passat’s “Crash” and each year’s “safest car for teens” guide. Meanwhile, new vehicles are loaded with enough infotainment and horsepower to tempt anyone to test the automatic stability control. We fool ourselves that by preventing kids from walking and cycling, we protect them from other drivers, though streets are made safer when more cyclists and pedestrians share the road. And of course, putting young people behind the wheel instead of on a bike or on their feet puts them at risk of maiming or killing someone else. Yes, parents can make multiple small efforts to make driving less dangerous to their children. But if our goal is to have dramatically fewer deaths and injuries, we must make it possible for children to travel fewer miles in vehicles. In a true culture of safety, parents would ask a different series of questions than which car to buy or which route to drive. They would ask: Does my child really need to take this car trip? Do I model taking some trips by other means? Does my teen really need a car? Can we live in an area with good transit? Can we make the area we live in more walkable? Until then, we can only hold ourselves so high above the “horrible parents” vilified in the news. Nice article, Anne. The greatest public health threat today to our children is obesity, and so many parents still schlep their kids by car to nearly everywhere. Little by little, folks are getting the idea that they can travel with their kids on transit or bicycle, but outside of the major cities, non-car owning parents are typically regarded with suspicion and confusion. Even in Brooklyn, where lots of people bike, lots of folks give us funny looks when we carry our baby in the bike trailer, as if we are crazy. Actually, it’s enjoyable, safe and healthy for us to travel together by bike instead of using the family car. Riding a bike always got me to school, to a weekly music lesson, to sports practices, and to friends’ houses. Inadvertently, it also made me much more independent and confident — something I wish for all the children in my life. One reason that people drive their kids instead of letting them bike or drive is to keep them safe from child predators. I don’t think your argument about letting children walk to school would go over with the parents of Etan Patz, Leiby Kletzky, Sierra LaMar, Ilene Misheloff or any number who were last seen alive walking to or from school. @pchazzz:disqus The fear you mention outlines the fundamental issue that appears to be plaguing a lot of Americans more and more: our “communities” are no longer communities, where neighbors would keep an eye out for one another, it’s a friendly outdoor environment where people go for walks and kids play outside, that extra 30 seconds saved from speeding isn’t more important than the safety others. Because kids hardly play outside anymore, it makes that one lone boy or girl wandering around seem very vulnerable, whether actual, perceived or both. And unless all the parents are both making their kids walk AND going to school board and town meetings to demand that their kids be kept safe on their commute to school, I doubt it’ll ever become top priority for the authorities. I grew up in a cookie-cutter suburban neighborhood where half of my neighbors drove straight into their garages, so that I never even knew who they were or what they looked like. Very few people ever went for walks and, despite the winding residential streets, drivers continually exceeded the 25 MPH speed limit making it very dangerous for kids or anyone in general. Hardly a community in my opinion. This example comes from a suburban context, but nevertheless it applies anywhere where people just want nothing to do with anyone else around them and want to be isolated, like the way the metal box isolates drivers from their outside surroundings. And after decades of this sort of development, we have a society where a lot of people have little trust in others and just get more and more paranoid about everything whenever they are outside of the protecting bubble, be it a car or apartment or house, etc. AC: I live in Bed-Stuy, hardly a “snobby” neighborhood. Yes, some of the schools in the burbs are nicer, but it is not necessarily a haughty-taughty thing to choose to walk and bike. The car companies have convinced you and millions of other Americans that to have a family means you must have a car and use it to get everywhere. I’m just saying that it’s not a must. It’s a choice to drive as the default mode, and it’s a choice that is expensive, and generally contributes to a sedentary lifestyle. pchazzz: the fear you mention is like saying we shouldn’t vaccinate children because Jenny McCarthy would object to the idea that all children should be vaccinated. People were also last seen being driven to and from school, yet you don’t use that logic to make the point that being driven to school wouldn’t go over will with a number of individuals. Individuals who seek to harm children or other people do exist and can reach a child whether or not that child walks to and from school or is driven to and from school. That’s a red herring that does not address the impacts of the choices that we make as adults and parents to live or commute in certain ways. “yellow journalism” “if it bleeds, it leads” modern media, including the risk of abduction by strangers. the whole child predator thing is a media hype. most kids get kidnapped or abused by family or friends. for schools Queens is the best in the city and competitive with the suburbs. district 26 is top notch. i’m currently zoned for the #5 elementary school in NYC which is in district 28. huge waiting list too and lots of people try to fake their address to send their kids there. and the area is a lot cheaper than some of these trendy neighborhoods with a 2 bedroom coop close to $1 million or more. i see parents drive their kids to school, but its probably a minority. i see lots of kids walk. but if you work outside of manhattan and drive to work why not drive your kids? It doesn’t matter whether the concern regarding child predators is perception rather than reality, keeping their kids safe from harm, real or imagined, is a factor in parents’ decision to drive their kids, whether you like it or not. I grew up in an inner city in the 1960’s. Mom drove me to school and I walked home. It was mostly safe, except for once, there wasa a man standing in front of a vacant storefront asked me to go in the store and tell his friend to come out. Of course, good little boy that I was, I did as I was asked. In the very back f the store was another man who grabbed my arm. I fidgeted and squirmed, until he finally let me go. pchaaz, Thinking about letting my nieces and soon, my own child, get about town on their own, I did a bit of research on child abductions. Each year there are about 115 children taken by strangers, with the rest kidnapped by relatives, friends of the family, etc. I think that works out to about 1 stranger kidnapping per 700,000 children. Certainly, encouraging a child to walk or bike is something each parent has to decide for themselves. Knowing the much publicized but extremely rare risks and the mostly unpublicized and unknown benefits should be part of any parent’s mental equation. One thing I realized with suburban car culture is when a car-cultured teen reaches college. You can tell when a person crosses to road diagonally, they never grew up to understand being a pedestrian. and snobby. Everytime I take the bus or lightrail here, people think I’m crazy. Everytime I bike the road, I get cursed at by road ragers. Everyone drives to their nearby gym. The city reached number 2 in DUI cases. Right below San Diego. San Jose is more of a bad imitation of Southern Califonia trying to badly influence the rest of the Bay Area. Driver Smashes Through House, Hits Baby in Crib. Police: No Biggie!